This is one of my favorite books of all time, and you should read it. I asked when I reviewed this book when books about the Holocaust/World War II would start getting stale. The answer is, I think, never. The world hadn’t seen a conflict that touched so many people before, or since, and there are so many stories here to tell. Plus, this book is so much more than just “a World War II” book. It’s above all else an incredibly told story. It focuses in on one person: Liesel, the orphaned German girl, and the people around her–but then zooms back out to the thing itself. A small but noteworthy note. I’ve seen so many young men over the years who think they’re running at other young men. They are not. They are running at me. The people who do not like this book tend to dislike it for one common reason: the writing style. It’s an experimental style, to be sure. This is no “once upon a time there lived a girl named Liesel” kind of story. 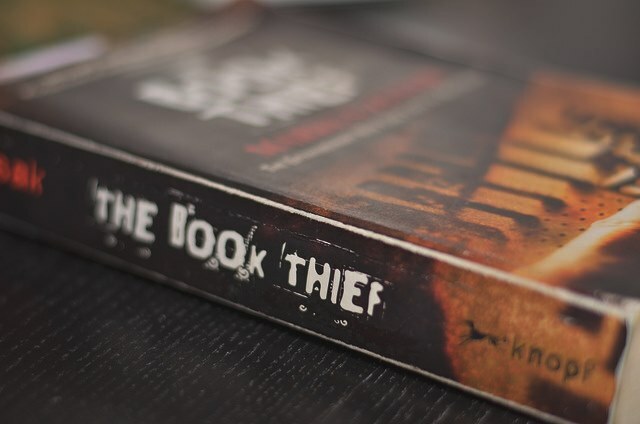 This book is written in the first person, but not from Liesel’s point of view. From the point of view of … Death. It sounds weird. It is weird. But it works. Zusak’s prose throughout this novel is so unbelievably beautiful that even recalling my favorite quotes cause me to tear up. I am in all truthfuness attempting to be cheerful about this whole topic, though most people find themselves hindered in believing me, no matter my protestations. Please, trust me. I most definitely can be cheerful. I can be amiable. Agreeable. Affable. And that’s only the A’s. Just don’t ask me to be nice. Nice has nothing to do with me. I urge you–don’t be afraid. I could introduce myself properly, but it’s not really necessary. You will know me well enough and soon enough, depending on a diverse range of variables. It suffices to say that at some point in time, I will be standing over you, as genially as possible. Your soul will be in my arms. A color will be perched on my shoulder. I will carry you gently away. Yes, it is weird. But so lyrical. I think people have two types of reactions to this kind of voice in a story–they love it and keep reading or hate it and stop reading. I loved it, and kept reading, and was rewarded by one of the most moving stories I’ve ever encountered. The consequence of this is that I’m always finding humans at their best and worst. I see their ugly and their beauty, and I wonder how the same thing can be both. The story starts with Liesel, on her way to bury her little brother. At his grave site she finds a book–The Gravedigger’s Handbook. She takes it. And thus begins a long career of book thievery. She maintains her love of books through moving to a new foster home, through the trials and tribulations of school. Through meeting her best friend, Rudy. Through book burnings. Through hiding a Jew in the basement. Through the rest of the war, amid devastating loss. Obviously this book is going to make you sob. As for me, I love sad books. If you don’t, this probably isn’t the book for you. But you’d be missing out. The quote at the end makes me sob, but I don’t want to write it out here because you need to read the book first if you haven’t. So go read it now, please. I loved this book! It’s the style that intrigues the reader and that makes it stand out from the crowd. I thought the movie was pretty good too, but so much was left out. Hah guess I’m the only who hates the book. I didn’t read the book, but saw parts of the film adaptation. Looks pretty good; perhaps I’ll give the book a shot! The movie was cute, but could not accurately capture the epicness that was the book. Please read it!